At first, some may think that there are not enough things available to create an Antarctica box. Don't let the seemingly sparse items deter you. Actually there are some unique and fun goodies you could add to your box. Now granted there are no countries there, but many have staked claims to parts of it. That opens up a great opportunity to learn about those research posts. Maybe having printed cards with pictures of various sites can be added. Also, you can find a lot about those brave explorers who went there. 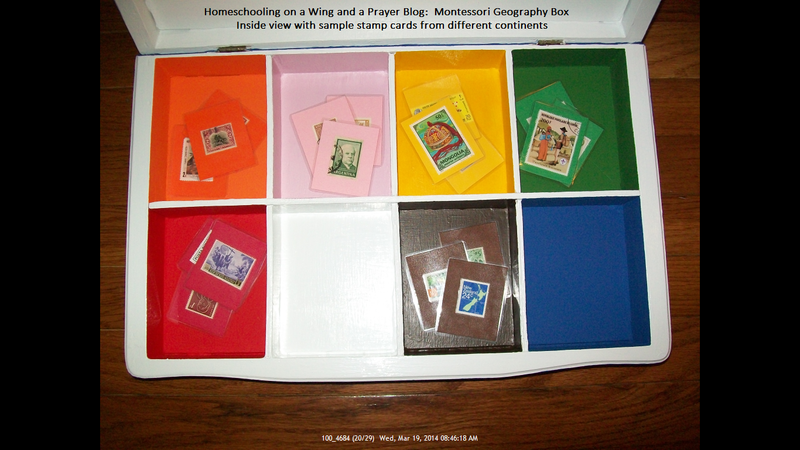 Maybe you could find stamps with pics of them, or put a small flip book/lapbook in the box highlighting them. The wildlife is mostly centered around the oceanic critters, but it is also where many of the world's penguin species are found. Think of all those movies [March of the Penguins comes to mind] that could accompany this study! So one can add pictures and miniature toy animals to the box. I looked through my Safari Toobs and see there are a few seals and sea lions and even a walrus. Sadly, not one of those species are found in Antarctica, and I do not want to buy the penguin one (which has a lot of them found there), so I won't have as many critters as I would like. That said, I do want to mention that I have noticed a few folks who have innocently placed polar bears in the Antarctica box. But please do not put them in as they are not found there. They live in the arctic polar regions of the north and should go in the N. America box, and yes-even in the Europe and Asia ones. I have seen way too many people add animals when they do not belong there. OK. There, I feel better. *Stamps (Ebay) -I looked for countries that have or have had stations there. *Fire/Rescue patch (Ebay) -I let my son pick which one he wanted. 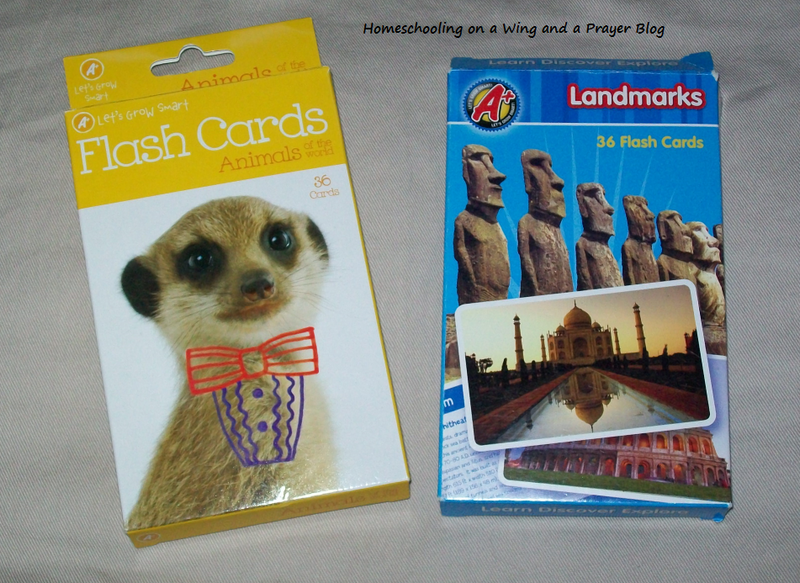 *Animal Cards (Target dollar bin area) -see the Australia post for a pic of the card box. I also just laminated a picture from an encyclopedia on the animals found there. 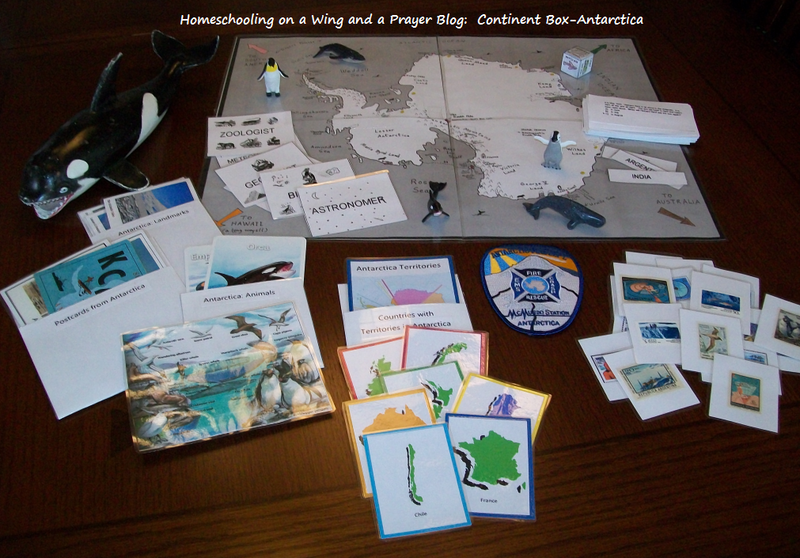 *Antarctica Territories Cards (made myself using Word images and Wikipedia then laminated them and put each area on color coordinating paper to match the control card). *Landmark cards-just found a couple different ones online, printed and laminated them. *Large Killer Whale-that is an old tub toy we had still. He has been sitting by the Ocean Box we are working on for his science. He doesn't go in the box, he just wanted to be included-LOL. *Antarctica Game (free download from Ellen McHenry's Basement Workshop) This is too big for the box so it goes in the basket on the top shelf. **I don't have the Antarctica map printed/laminated yet. That is for his reference for various mapping activities and such. That will go into the basket on the top shelf. I have done a lot of Pinteresting and have seen many a posts on continent boxes. I see some ladies have mentioned a few of the following sites listed below. I really don't need these but many of you may. Keep your eyes open for other neat add ins. I would love to find a mini-replica of Shackleton's ship or even a model of a scientific center [you know that doesn't cost a fortune and actually exists] to add to our box. Anyway, check out these resources too. Who's Eating Who? book download (free) There is also a bunch of other activities/info on that site (which we will visit a lot during our study) **Just keep in mind the cost of either printing this at home or thru an office supply place. It is very colorful! And there you have our Antarctica box. I was so excited to stumble across the Continent Box idea a whilst back. Sadly, I didn't think of them. Nor had I heard of it prior to just this past year-so my older kids totally missed out. But alas-I have one student who can benefit from it. I will be doing a whole geography series (of posts) as we move through the various continents, but for now-here is what we have in our box. 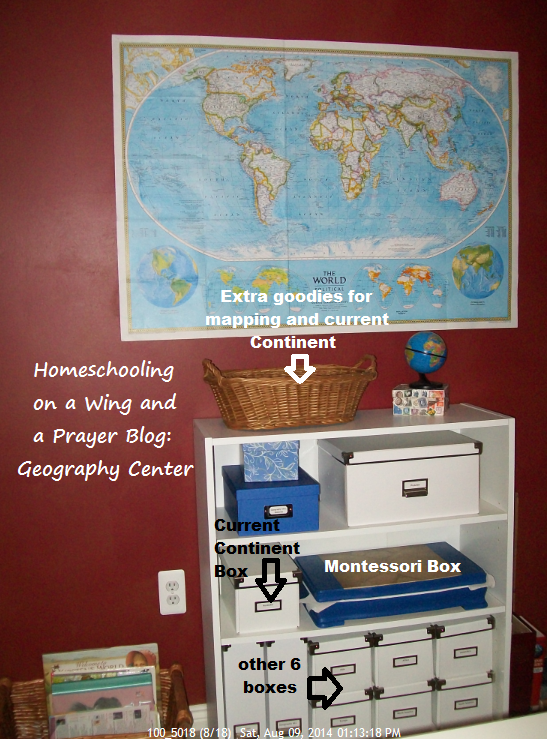 For more (and awesome) ideas, just search Pinterest for Continent Boxes and Geography Boxes. A ton of pins will pop up. Our boxes go on our Geography shelf. 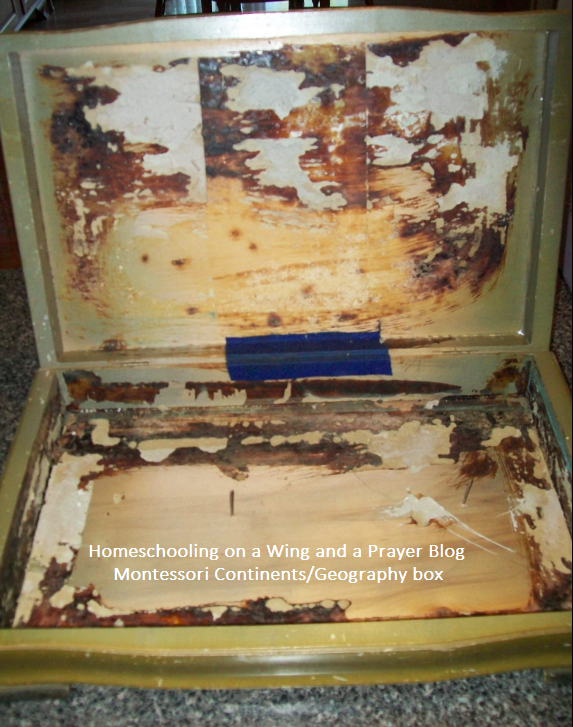 The current continent (box) to be studied sits right next to the Montessori sorting box on the second shelf. Extra things go in the basket on the top (in this case, the boomerang) that do not fit inside the Ikea box. We also checked out a ton of books from the library on Australia, New Zealand, Fuji, Tasmania, the Aboriginal peoples and the Maori peoples. I also grabbed some arts and crafts books so that we can do some activities that relate to the area. If I had more kids coming up behind him, I would have purchased more stamps to sort but what I have is sufficient for him. I probably would have bought the Montessori musical instruments, people and animals cards as well, but since my student is now 13-it just wasn't necessary. I only used/laminated the cards that have all the info (not the 2 part matching ones) on it. 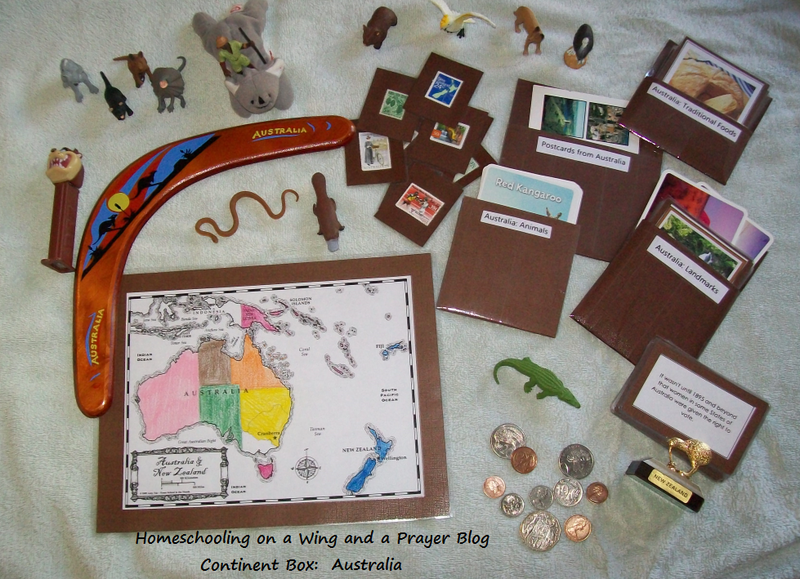 I do not have any flags in the box because the Homeschooling in the Woods map set has notebook sheets [to fill in various nuggets of info for the region/countries] with an area for a flag. The only thing I won't print are the flags, in order to save on ink since it can be spency. I am purchasing some stickers that he can place there instead. These notebook pages will go into a Countries of the World binder we will build over time. BTW: I could have labeled this the Oceania box but since our kids were taught that Australia is one of the 7 continents, not Oceania, I didn't want to change it. Obviously, you can label it as such. I really don't like how they keep changing things, like the Antarctica Ocean to the Southern Ocean and Pluto being nixed as a planet. I mean leave it alone already. Sheesh. LOL. 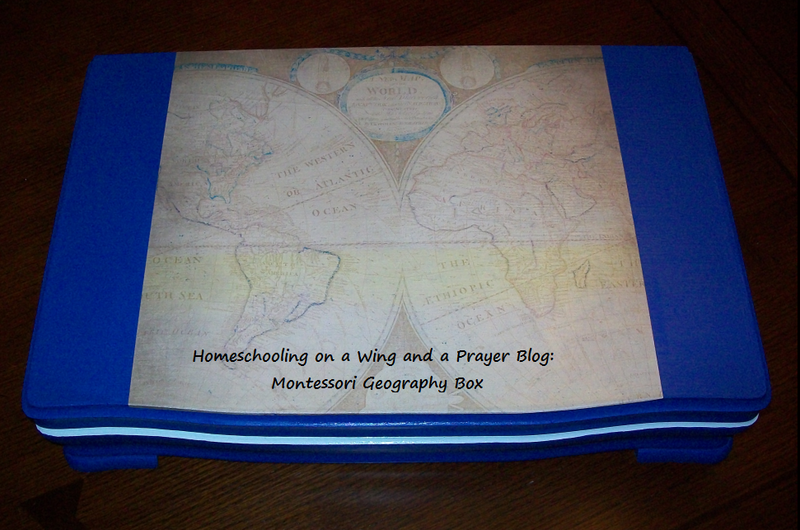 So back in September I posted that I wanted to make a Montessori Geography box (I had seen an awesome example on Pinterest). I found an old, smelly and 'in great need of care' silverware box [the type that many a bride received for her wedding which was quite popular in the 1950s-70s] that would be perfect for the project. It was marked $2 or $3 but I talked it down to a whopping dollar bill! My goal for this project was to spend as little as possible and I actually managed to do just that as the total overall cost was under $10! SO I had the box and I knew what I wanted to do with it-but it took many steps to accomplish. That was September remember? Due to some health issues, then the holidays then tucking it aside to then finding it and saying, "OH yeah-need to finish this! "-it took longer to get done than it should have. So to start, I had to allow for at least a month of 'freshening' to get rid of the musty smells. That meant ripping out the gross felt and little doodads that were meant to hold the silverware. That helped eliminate some stench-but then I had to scrap off (as best as possible) the ugly glue, then rub the wood down with bleach water, then place the box in the sun to further the process. At night I placed a bowl of water with bleach in it inside the box, closed the lid and let it continue working on degrossifying it. I learned that trick from Martha Stewart many years ago. Yes, it was that gross! When it was finally ready for the box compartments, I sent the hubby and son on a search and find mission. Thankfully we live in a sub that still has construction going on and since my hubby has spoken to several of the building crews before about scrap wood, it was not a problem finding some luan wood for this. Frankly, with the layering of that wood I can say it was a pain to work with. So if you decide to do something similar-look for a piece of wood that is one solid sheet and not layered together due to it's inherent need to split. Anyway, I decided how I wanted the boxes to be and ordered my cut pieces from my handyman hubby. Due to the glue issue (that was under the felt) I had two pieces of luan cut to lay down over them to give me a fresh look. Then he cut a few strips to build the boxes. That was the hard part. We do not have a mini-Norm Abram workshop about the homestead. But we made due and I am quite pleased with the results. After the liquid nails (glue used to adhere it) dried we were ready for paint (I did sand down the wood to avoid splinters) and after several coats it is complete. I found scrapbook paper I liked (at Hobby Lobby) and just cut it to fit. it to the top, then coated the entire top/outside with a thick layer to protect it. Furthermore, I also have to print and laminate the maps I want to go on the interior lid of the box. I will put little Velcro dots on it to allow for easy map changes, which means all maps will have the dots as well so they will adhere to the main lid area. This is key to multi-use flexibility. If I just slapped a pre-school/K level map onto it, I could not use it for a variety of things I have in mind. Especially since I am using this with an older elementary student (right now) but want to be able to use it for future younger students as well. Oh, and we need to put a hinge on the backside of the lid. Since the original hinges are small, are at least 40+ years old and with the additional weight from the the luan, it needs that additional hinge support. I highly recommend doing that as well if you make your own. 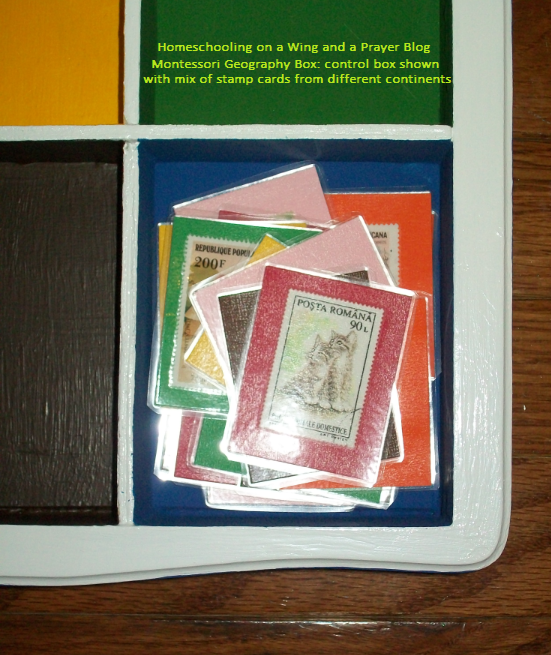 I did paint the box sections to match the Montessori color code for learning the continents. I also included a box for Antarctica! This is important because several countries have territorial claims to it. I therefore made 8 sections. One for each continent and one for what I am calling the control box. That is where the collection of items to be sorted go. I will do a separate post on different things that I hope to do with our box as soon as I get all that done. One step at a time-LOL. Example using stamp cards for different continents. Antarctica is not shown b/cuz I have not received the stamps yet but you get the general idea. 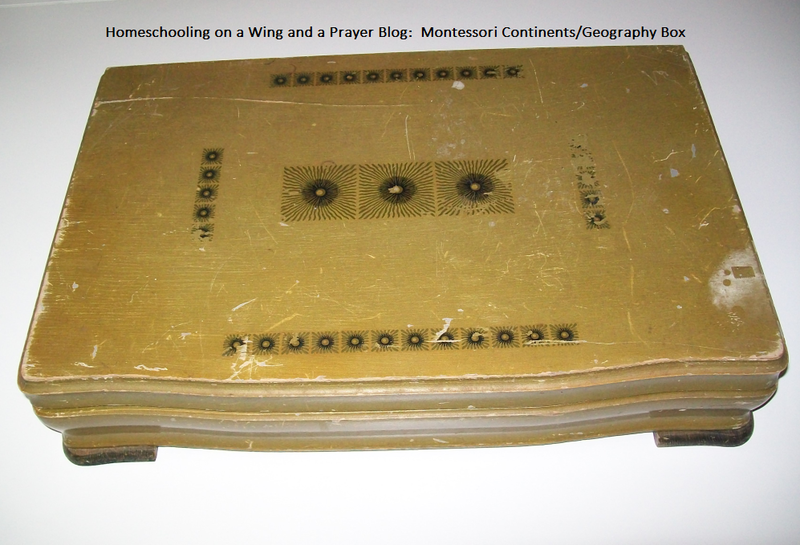 The map that would be used would be the general color-coded continent map for Montessori. I will link all the sources in the post about how to use the box once I have that completed. 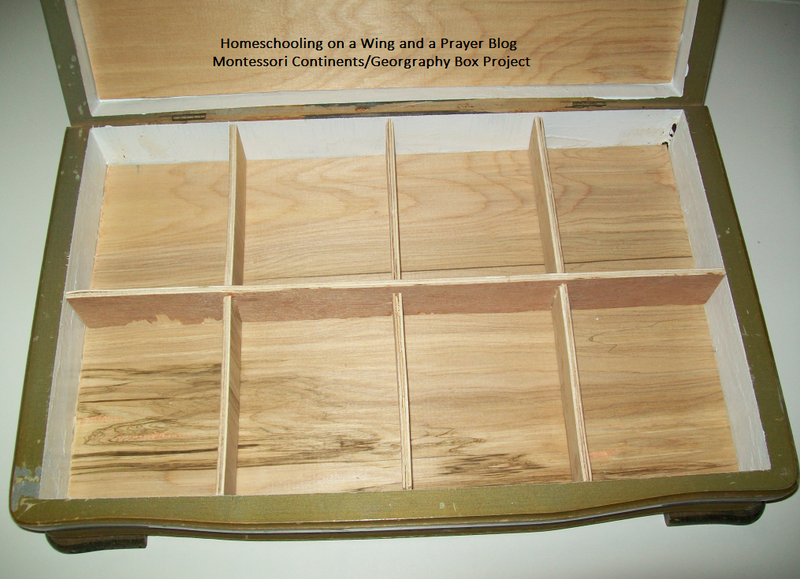 So what does one do with all those little pieces or parts that are a must when using Montessori works [aka: a specific activity meant to teach something], or some matching activity or whatever it is you have that will need to be contained? What can you use that keeps them all nice and tidy and looks good too? 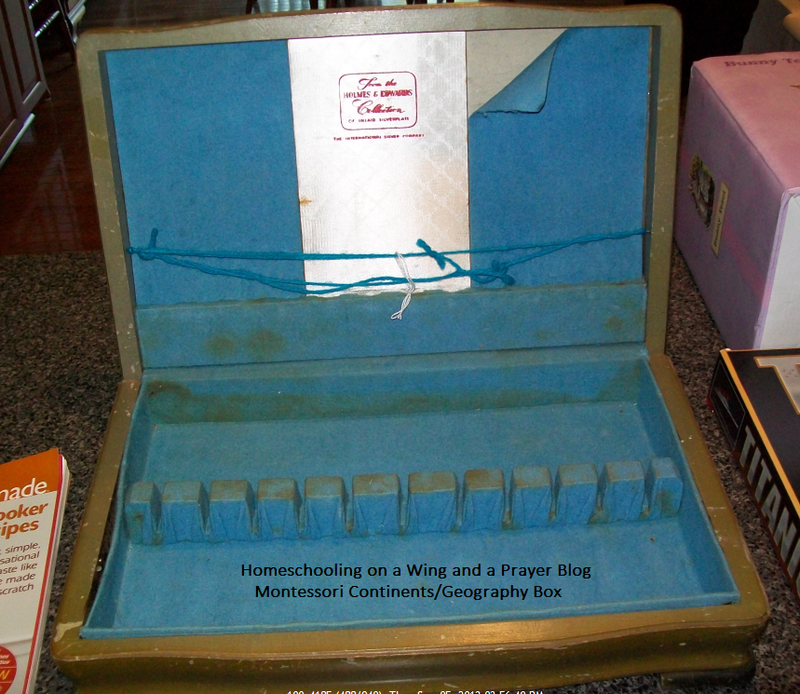 Anyhoo-the reason I am posting this because there are times folks need a box or something to hold those little goodies. So why pay a lot of cashola for something you can make? I don't know why you would. 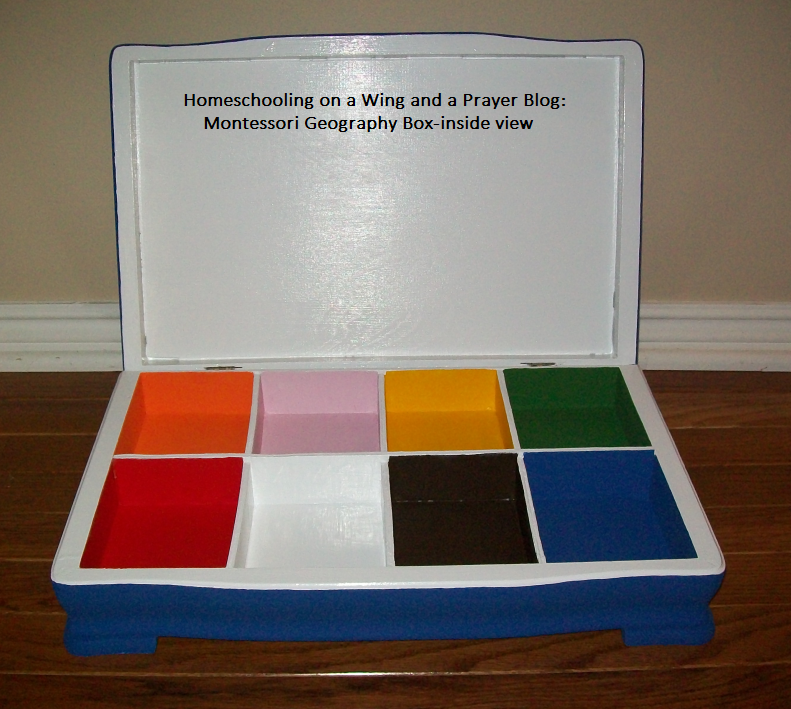 I try my best re-purpose things when I can; this is a fun, creative way to get a few storage boxes that are sturdy and useful for our schooling needs. Now I do not have a canister of Modge Podge about the house, so I did what any frugal gal would-I made the 'poor man's version' of it using Elmer's Glue and water to thin it. Worked like a charm! Figured I would just do a picture tutorial (for those who have never tried such things) and put a wee comment under when necessary. Hope this helps you out. Find a piece of scrapbook paper that appeals to you. I recommend using the thinner style. Then figure out there the lid fits best-allowing for enough paper to cover up over the sides and slightly over into the inside edge. -but not too far in as you can always fix as you go. lid then lay down in the center area of your paper. scrapers (or a soft edged tool) to get rid of any air bubbles. Glue, fold and press out any bubbles, along all sides. Trim off any excess and tuck the corners in nicely. Try not to over do it on the inside because the extra bulk may prevent the lid from going over the bottom. Coat the entire top/sides with thin layer of glue. Let dry thoroughly. I actually did two coats. We're going to be covering birds and insects and swimming creatures this year for science. I have always enjoyed activities that help reinforce the lessons by using fun little goodies to do so. Being that I have a Montessori background, and love the Charlotte Mason method-I try to combine the best of both worlds when I can. So I found (like why didn't I take a closer look at these before? Really? I am not happy with myself for walking right past these little gems for some time now-OY!) Safari Ltd. Toobs. These containers hold a nice amount of critters, or people or flowers or well-known landmarks that can easily be tied into most lessons. One can use them for map work, science activities, matching lessons, and more. So my goal is to collect the Toobs we need for our year. I should have all or at least most of them bought before Oct/Nov. I am of course, focusing on the immediately needed ones first. I have already purchased both the backyard birds and the exotic birds sets. Being that I hate paying full price, and the couponer in me demands this-I gathered up my 40% and 50% coupons for JoAnns to save a few bucks-which I could use b/cuz they were not on sale. JoAnns has them for around $9 something and so I was able to get one for about $5 ish and the other around $6ish. I will continue to use the coupons until I have all the sets I want :)! Thankfully, on the Safari Ltd. site, you can click the image to see what is included. If you ctrl/prt sc then go to MS Paint (if you have such programs) you can cut/trim it and then save it to put onto MS Word to create a control card for your activity. I enlarged one kinda big (for youngers to place the actual bird onto) but it kinda fuzzed the wording. So I also shrunk it to a better size (as a control card for my son) that isn't so bad. I also used the MS Word to create name cards as well. I then printed and laminated for long term use. I then will put it on the tray (as pictured, but I am going to paint it white) when we get to those chapters in science. It is just a kinda fun extra thing for my son to do to stave off boredom. 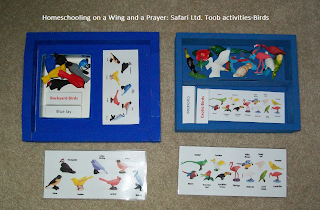 For the younger set-it is a great activity (very Montessori) to help learn the different birds (or whatever critter you want to study). 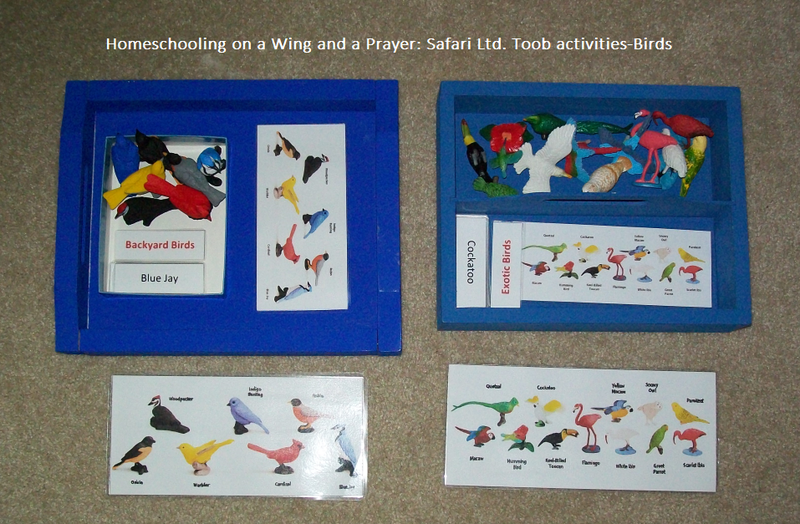 The basic deal is that the student takes the word card and matches it to the right bird. I will also be purchasing the N.A. animals and the river ones too. I need that snapper from the river set to use along the Minn of the Mississippi book (BFB geography). Figured we would have fun occasionally moving the turtle down the great Mississip (with our sense of humor I am sure it'll be interesting) map that he fills in/colors as he goes thru the chapters. And it'll serve as a great replica of what a real one looks like. Mind you-he's already had fun poking at a snapper or two when his dad and him have been out and about on their walks. He knows a snapper and understands just why it is called one. That said, because this is one critter you do not want to handle for real-this is a great option to have! LOL. Plus, I can pull a lot of those animals from the river set for our history study of the expansion west (in the US) that we're tagging into our Calf. history (by BFB). Once I get a fun set together for that-I will be sure to post. The beauty is you can create what you need. 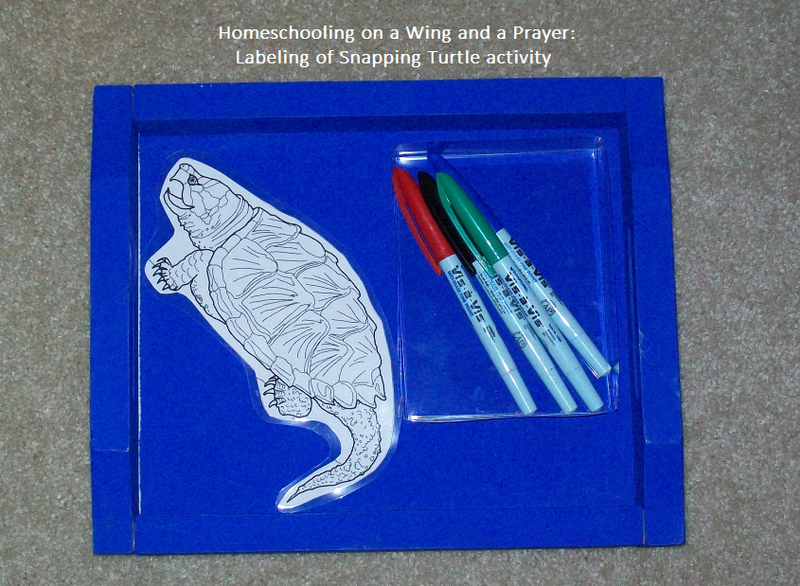 I also printed off a free coloring page of a snapper to use to teach turtle parts. He covered that way back when he was in Kindergarten but obviously, it's been a while and why not revisit it? So I will the laminated pic, some Vis-a-Vis markers and a control card (still need to create) that he can use to remember them. He'll just use different colors for different parts. I will also make an actual turtle control card with the correct areas labeled so he can self-check it. I will probably do it for the Seagull one I have when we do the book, Seabird. I have to go thru the Apologia notebooking wkbk I bought to go along with the Zoology 1 I have. If they don't do that-then I will create one. This is just a simple idea that can create a fun, integrated 'accessory' for your student's learning experiences. Think outside the one-dimensional when you are looking for different ways of teaching and you'll be surprised at what you find! **the Toobs use the correct names for most of their sets, which is good b/cuz I prefer the child learns the right name of an animal. For the younger kids, you can get away with saying "bird" or "flower" but it does help significantly if you label it as it should be-their specific name. I will also make cards with the Latin names for my son to match up because when we do our nature study notebooks (CM way), we always add that and I want to be sure to provide another opportunity for him to learn them. **I am not an associate for these companies-altho I should be LOL. Just wanted to share what we have found to be very useful for our lessons. Christian mom to four (29 dd, 27 ds, 23 dd and 16 ds) and a wife to my best friend. 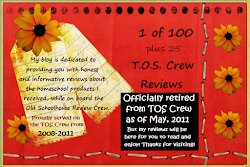 We have been a homeschooling family for 20+ years [including homeschooling thru high school] and are still going. Some time back, I became acquainted with the most gracious, and enlightening Mrs. Sharp. She ushered in fanciful new ways of doing things, by providing her wit and charm and seemingly endless monthly themed knowledge in her beautifully illustrated book, Mrs. Sharp's Family Traditions [by Sarah Ban Brethnachs]. I have found this to be one of my favorite all time books. Hearkening back to the Victorian era, I step into a world of ideals, crafts and poetry just waiting to field tested on my precious children. So in honor of this most dignified lady-I will have a Moment with Mrs. Sharp section on this blog. As we work through the months (and mind you-we don't do everything but pick and choose and perhaps even skip a few things), I will post the projects for you to savor. This is all very Charolotte Mason-esque in nature, as it provides wonderful handicrafts and poetry to add charm to your homeschool. So grab your favorite cup of tea or coffee, come join us in the parlor and discover the world of Mrs. Sharp. **I personally purchased this book, so I have not received this in exchange for anything. The mini-review is based solely on my own personal opinion of it. 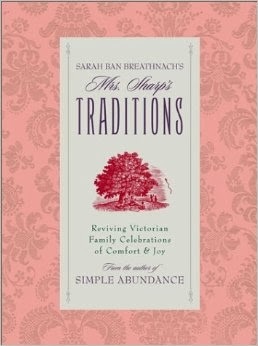 ***Mrs. Sharp's Family Traditions is currently out of print, but can be obtained through online book stores. If your family, or anyone you know whose children have a parent with a terminal illness-our friend Kristen, who sadly passed away late in 2012, started an organization to help them out. I have documents up on my Scribd page! Check out this awesome site! Great resources for "Going Green"